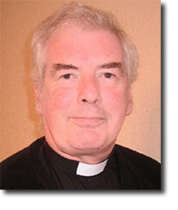 Fr Alban was appointed as Parish Priest of St Patrick’s in September 2005. He is originally from Manchester and was raised and educated in Wythenshawe. After leaving school he worked for Barclays Bank for a few years before going off to Canterbury to study at the University of Kent. He started training for the priesthood in 1974 at Ushaw College and was ordained in 1979. He served at St Joseph’s Upton and English Martyr’s in Wallasey before embarking on a number of diocesan roles including Bishop’s Secretary and Chancellor. Returning to parish life Fr Alban was appointed Parish Priest at St Thomas Becket, Tarporley then Our Lady’s Latchford followed by St Peter’s Wythenshawe where he helped develop a Team Ministry for the area before moving to Wellington. Fr Alban’s hobbies are walking, music and reading.